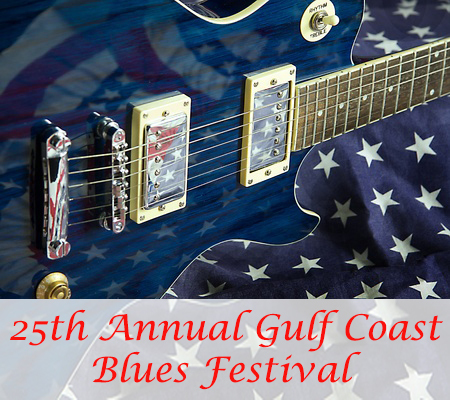 The 25th annual Gulf Coast Blues Festival will be held September 7th, 2017, at the Jackson County Fairgrounds in Pascagoula, Mississippi. This annual event, sponsored by the Mississippi Gulf Coast Blues Commission, is a fun way to enjoy some great music and tasty food in an environment that is suitable for all ages. This event has a history of being one of the area's best musical events of the year and is featured on the list of top 20 festivals by the Southeast Tourism Society. The Gulf Coast Blues Festival is a family friendly event that offers a great chance to introduce the kids to the blues culture. There will be lots of music to keep the kids entertained and even some events for kids to participate in. The event space has plenty of room for families with young kids to bring strollers and even blankets to sit on while listening to the music. The headliner for the Gulf Coast Blues Festival will be the Original B.B. King Blues Band. There will be several other local and national artists and bands at the event. Plus, the event space is large enough to accommodate chairs with plenty of room left for those who wish to get up and dance. There will be many local vendors at the event selling food and drinks, allowing visitors to spend the entire day at the event with the family. This event will be held rain or shine, with the use of a covered pavilion at the fairgrounds. Visitors should be aware that no outside food is allowed at the event. But there will be a variety of tasty options that can be purchased from vendors. The gates will open at noon and music will begin at around 1 P.M. The event will have plenty of parking at the fairgrounds. The address for the fairgrounds is 2902 Shortcut Road in Pascagoula, MS.
Advance tickets can be purchased for $20. Tickets sold on the day of the event will be $25. Tickets can be purchased online through the Mississippi Gulf Coast Blues Commission website. There are also several local businesses in Mississippi and Alabama that are selling tickets on-site. The list of businesses selling tickets can also be found on the website. The Annual Gulf Coast Blues Festival is one of the highlights of the year for those who enjoy blues music. Visitors and locals alike will enjoy the music, food and drinks, and other entertainment that will be featured at this event. Plus, visitors have the opportunity to share in the blues culture with other music enthusiasts. This event is appropriate for all ages and offers a great way to spend the day with the family enjoying great food, music, and camaraderie with other blues fans. Anyone visiting the Mississippi Gulf Coast area on September 9th, 2017, should take time to enjoy the festival and experience the blues way of life.